About the Wine: Rutherford Ranch 2014 Napa Valley Merlot is made from 100% Merlot grapes sourced from, well, Napa Valley. It’s not a fancy single-vineyard designate by any means, but please stay with me. The wine was aged for 10 months in oak. Type and age are unknown, but I would guess predominantly neutral French oak (with not a lot percentage of new in the mix). Flavor Profile: Upon opening the bottle, the Rutherford Ranch 2014 Napa Valley Merlot isn’t extremely aromatic, but emits subtle scents of over-ripened blackberries. Pouring the Merlot from bottle to glass, the color is reminiscent of a gem just pulled from the ground — it’s a somewhat luminescent garnet, hampered by a bit of dust or grit. In the glass, once the wine has settled, there’s even less sheen, and the color is more of a rusty, rocky rouge. Initial aromas from the glass bring to mind red or orange wildflowers. Swirl and sniff again to reveal the earthy aromatics of eucalyptus trees — those long, skinny dried leaves that crisp so easily in the sun; the paper-like shedding of its bark. Move your nose to the top of the glass, away from the wine, and you’ll find just the slightest hint of milk chocolate. 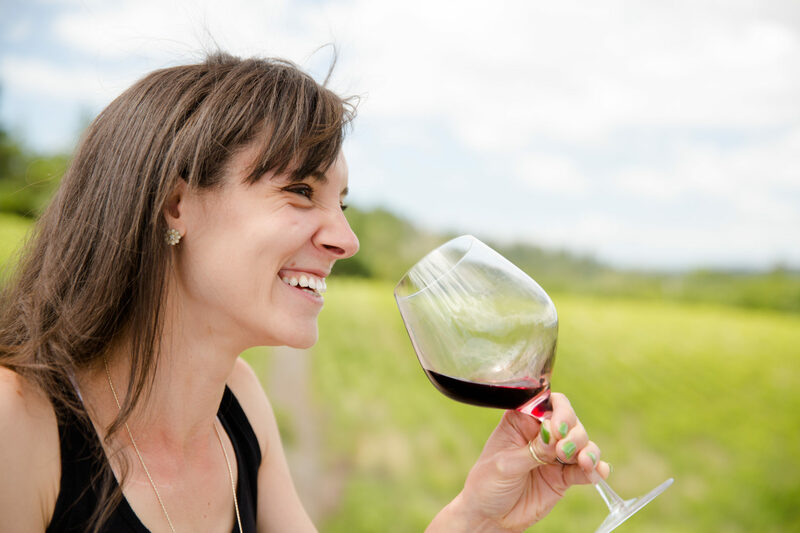 Bring your nose deep into the glass, take a big breath in — here you will discover the wine’s acidity. Though subtle on the nose, the acidity is the first thing noticed on the palate. Initial flavors are of tart, under or just ripened strawberries and cranberries. Drinking it i found myself thinking, “This is a really weird Merlot” — not as passive as I’m accustomed to. The acid is real, but so are the tannins that enter mid-palate. They grip each taste bud and produce a solid, defined finish with lingering dried fruit and cigar-esque flavors. It’s as if the wine is the story of the life and death of a poor strawberry. Food Pairing: I paired the Rutherford Ranch 2014 Napa Valley Merlot with a seared salmon filet accompanied by a blueberry and fennel salad. This was a good choice. The softness and richness of the salmon did well to cut through both the acidity and the tannins of the Merlot, while the blueberries (obviously) paralleled those dominant fruit flavors. Knowing the wine’s tendency towards acidity on the palate, I encourage a rich main dish when deciding on your food and wine pairing with the Rutherford Ranch Merlot. More Info: If you haven’t read my review of the Rutherford Ranch 2016 Sauvignon Blanc, definitely check it out. I received the Rutherford Ranch 2014 Merlot as a sample for review. (Cheers!) Retail: $26. For more information about Rutherford Ranch and to purchase wines directly, visit the Rutherford Ranch website.